For other uses, see Sennar (disambiguation). 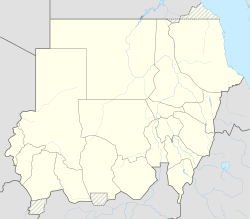 Sennar (Arabic: سنار‎ Sannār) is a town on the Blue Nile in Sudan and capital of the state of Sennar. For several centuries it was the capital of the Funj Kingdom of Sennar. Sennar had an estimated population of 100,000 inhabitants in the early 19th century. The modern town lies SSE of the ruins of the ancient capital of the Funj Kingdom, 300 kilometres (186 miles) southeast of Khartoum, the Capital of Sudan. It is located close to Sennar Dam, which spurred agricultural activity when it was completed in 1925 for crop irrigation. The Dam was designed by Sir Murdoch MacDonald and built by British contractor, S Pearson & Sons Ltd.
Today there are two towns bearing the name Sennar. Sennar Al-Taqatu' (i.e. Sennar Junction), the older one, represents an actual continuation to the ancient Sennar, both in time and geographical location. The junction element came from the fact that the major Sudanese railways intersect there, the area being in the heart of the Anglo-Egyptian Sudan at the end of eighteenth century. The other is Sennar Al-Madeena (i.e. Sennar City), 5 km ESE of the Junction, located beside the Sennar Dam on the western bank of the Blue Nile. It was built over the ruins of a small village called Mok-waar which was notable in the former cultures of the tribes of African origins who lived there before the arrival of Arab tribes to the Sudan. The city is home to Sinnar University, established in 1977. Sennar has a hot desert climate (Köppen climate classification BWh). ^ Walker, John (1810). "Sennar". The Universal Gazetteer. revised and improved by Arthur Kershaw (5th ed.). London: J. Johnson. OCLC 33422506. ^ "Sinar University". African Studies Center. Archived from the original on 2011-08-12. Retrieved 2011-09-17. ^ "Sennar Climate Normals 1961–1990". National Oceanic and Atmospheric Administration. Retrieved 22 October 2016. ^ "Station Sennar" (in French). Meteo Climat. Retrieved 22 October 2016. This page was last edited on 7 January 2019, at 02:31 (UTC).